It was the first visit to the Imperial city, Tokyo after this summer. I was so happy because there were many audience at our show. Thanks a lot. We’ll come to Tokyo in March. I’m excited. We’ll upload the information soon. 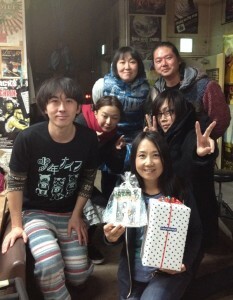 Photo: LEO Imai-san and Nattsu-kun came to our show. Cool. 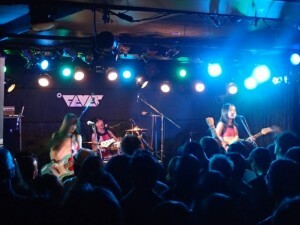 Photo:”Team Tokyo” they are very good friend of us and support Shonen Knife in Tokyo. 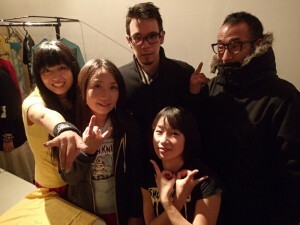 Mizuki, Keiji and Akane from papalion, Mami Saitou who drew the artwork for Pop Tune and a photographer Mr. Katsunaga. They gave me wonderful birthday presents. 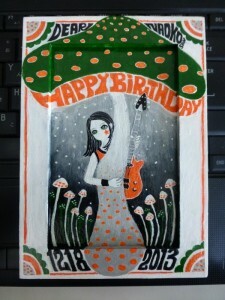 Mami Saitou drew a wonderful painting for me. The color tone of this photo is a little different from the actual one. I display it on my PC desk.